As many readers will know, we have had several articles written by Kousaku Yokota sensei in previous issues of SKM but never before had an actual interview with him until now. 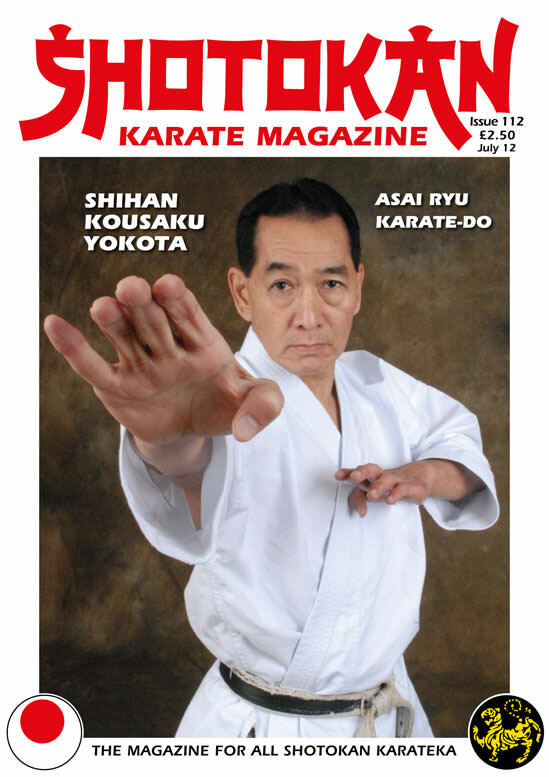 Some of his articles have been quite controversial where he has described his views on the many so called Myths surrounding Shotokan karate-do and indeed he has published a book dealing with this very subject. Like many other senior instructors, (for example Rick Jorgensen in the last issue who carries on the karate style, tradition and philosophy of the late Nishiyama sensei) whereas Yokota sensei makes no secret of being an avid follower of the late Asai sensei's karate, and he explains his reasons for this in the interview. It seems that several world famous Shotokan senseis who have now passed away, still maintain a huge following around the world. The four that readily spring to mind are senseis, Asai, Kase, Enoeda and Nishiyama who all had a massive influence on literally thousands of Shotokan karateka who continue to practice the unique styles of karate developed by these past Masters, all who came from the Shotokan school. I remember Yamaguchi sensei as a very young guy who came here (UK) from Japan in the early 1990's on a course with senseis Asai, Abe, Kagawa and the other Yamaguchi (much older and no relation, I think). He has some interesting points to make in his interview especially regarding the introduction of new kata which seems to be catching on these days amongst the various Shotokan associations. Personally I've got enough problems with the standard 26 Shotokan kata and getting to grips with the in's and out's of those, and continually finding answers to the bunkai puzzles we have been left with, so for me (and many others I believe) this number of kata is sufficient. Gichin Funakoshi taught just fifteen kata and even then he suggested that probably five or six would be sufficient to work on in a lifetime! But good luck to anyone trying to learn new forms if that's what interests you. The article by Bob Remington will strike a cord with many older karateka for sure. This story is very common with people who started in the 1960's or 1970's. With the petty club politics and the even higher, more complex organisational politics, causing many innocent young karateka who started in those days to become pawns in the political karate game, when really all they wanted to do was practice karate and hopefully improve as time passed. Many times people were rushed into attaining Black-belt status. Bob's Gyo (path) has taken him through much adversity with numerous physical problems over the years of training, yet he still continues along the way, as do many others. Regrettably we have had to increase the SKM subscription fee due solely to astronomical postage charges. I'm sure readers will understand this situation. As probably you all know, on January 12, 2010, the small Caribbean country of Haiti, was struck by an earthquake magnitude 7.0 which reduced to rubble, among others, parts of its capital Port au Prince. Being the poorest country in all Latin America and one of the poorest in the world, it is easy to imagine the effect that a tragedy like this had on the country and its people. More than 315,000 deaths would be accounted for with a similar amount of wounded. The number of homeless people would reach the two million. A work assignment took me there just three weeks after the quake. My country’s Embassy had been totally destroyed and a new building had to be found as soon as possible. I was to be part of the team to find new premises and make them operational, a task that would keep me in Haiti for thirteen months. The author Francisco Estévez (centre) with members of the JKA Haiti advanced class. I remember boarding the small United Nations propeller that would take me from Santo Domingo, in the Dominican Republic, to Port au Prince. As we approached the airport, I could already see the considerable damage on buildings and streets but nothing could have prepared me for the level of devastation I was about to witness first hand. The whole city looked like a war zone heavily bombarded with its infrastructures destroyed. The local parks had been turned into refugee camps where huge amounts of people were living in the most overcrowded conditions in camping tents or just under a canvas, without water supply or the minimum of hygienic conditions. Human and animal waste was lying around everywhere together with garbage of all kind. It was particularly shocking to see that some locals, both men and women, would answer calls of nature where it took them and did not hesitate to urinate in the middle of the streets. Under these conditions and with a temperature of 86ºF combined with a high humidity level, breathing fresh air was an unimaginable luxury. On occasions a particularly unpleasant odour could be perceived and I was told that it came from the many collapsed buildings that still had corpses beneath. It was not easy to get some sleep during the first nights due to the still frequent aftershocks that from time to time woke us up. As a precaution, many people had opted to sleep on the streets. I remember a particular occasion at around 4.00am waking up to the desperate cries of a neighbour woman calling out for someone who probably she had lost. Although I did not understand what she was saying I will never forget the agony contained in her words. My colleagues in Haiti who had survived the earthquake carried inside them a myriad of emotions caused by all they had watched the dreadful night of the quake and the days that followed. To them I was “fresh ears” that could listen and some times even a shoulder to cry on, so whenever we met on our spare time I was incessantly told about all the horrendous incidents and situations they had witnessed. I did not blame them since I knew this was a kind of post trauma therapy but it certainly did not help me acclimatize to my new environment. Soon it became crystal clear to me that if I was to remain focused in my work and centered within I would urgently need to find a space where I could clear my mind and do some exercise or even some training on my own. So I started to search for such a place, not an easy task considering that the options of parks, open air spaces or even jogging in the streets had to be discarded before hand. As luck would have it, I heard that one of the few gyms in the city had recently reopened and I didn’t lose any time in going there and checking it out. It was located, and still is, on the 4th and 5th floors of a building that had survived the quake. The facilities and exercise machines where nothing like the ones you would find in Europe, but they were adequate. The place was fairly big by Haitian standards and it was clean. On the 5th floor you could train in the open air. The manager, when showing me around, explained that very few members had returned since a phobia towards high buildings still prevailed among the population. That didn’t bother me. I was extremely happy to have found a place where I could jog, do some work with weights, some static cycling and, hopefully, some Karate on my own. With the gym in my personal agenda, things started to look up quite a bit. I had something to look forward to now in the evenings, since there was no other options whatsoever to spend spare time. The gym members were mostly United Nations Stabilization Mission soldiers, Embassies´ staff and members of humanitarian organizations, so the atmosphere there was always an international one and it didn’t matter your place of origin, you would always find someone there who spoke your language which made making new friendships a lot easier. One evening soon after having enrolled I took advantage of the fact that the aerobics area was empty and decided to go through my katas, something that I badly needed by then. I do not like to practice Karate if there are people around, but I figured that the only two men playing table tennis at the other end of the gym would not pay any attention to me. Well, luckily for me one of them did. Interested..? You bet I am! I have to admit that I had left Spain with so many different concerns on my mind that I had not even considered the possibility of finding an active Karate dojo in Haiti, less a Shotokan one. I had seen the news and reports on TV and the chances of dojo training in such a scenario seemed to me far fetched. But now I had two weeks to mend that error and luckily for me, a plane with humanitarian aid would be coming from Madrid in a few days so I had enough time to contact my family and ask them to pack my two gis and my obi and have them sent to me in that flight. Francisco (left) saying thank you and goodbye to sensei Nader. On my first class I was introduced to sensei Joiseus Nader, 6th Dan and Chief Instructor of JKA Haiti. I was ready for the classical questions on my background, you know: what is your rank? Who is your sensei? What association do you belong to? I have travelled around the world and in all dojos I had always been asked these questions, sometimes out of a healthy curiosity and others out of petty politics. However, no one ‘ever’ in that dojo made any of those three questions. I was a karateka willing to train along with them and that was all they cared about. My affiliation was obviously none of their concern and although I am certainly proud of all the sensei I have had, being a reserved person myself I welcomed that. For the next year, that would be my dojo and my bit of heaven in hell. I would anxiously look forward to class time. As one could expect from a JKA dojo, classes were structured in Kihon, Kata and Kumite. They were conducted in Creole, which together with French are the two official languages of Haiti, but as deference to me, sensei Darbouze (the gentleman who saw me training while playing table tennis) translated into English whenever the chief instructor elaborated on something. Above all, the lessons were hard and demanding for just after ten minutes my gi would be soaked with perspiration. Being the only foreign student there put a certain amount of stress on me. That was their honbu dojo and as months passed by, it was more frequent to receive the visit of students from other parts of the country, particularly prior to exams or competitions. It was obvious to me that when doing jiyu kumite some thought they should check out whether I was qualified to be in that class but once they saw that I was, I was always treated with courtesy and respect. Circumstances were not the best for socializing and my lack of proficiency in the French language did not help so I never had the chance to learn much about their lives. I did find out through a third party that one of them who never missed class had lost his wife in the quake but you could have never guessed it. His attitude when training was not that of a beaten soul. Doing jiyu kumite with the instructors was a treat on its own. The three of them were powerful, fast, accurate, serious and clean; their technique far superior to mine or any of the other students. Unlike some other parts of the globe I have trained where if you made the “mistake” of landing a technique on an instructor you would pay dearly for it. I found none of that egotistic nonsense in Haiti. Whatever tragedy they had gone through, whatever loss they had experienced, whatever frustration their country’s situation had added to their lives, it did not reflect upon their spirits. To me, the karate I experienced in that small corner of the world was Karate-Do, one hundred per cent. Soon it will be a year since I left Haiti. I am back in Madrid now and again I train in a first class dojo that has Japanese tatami and a splendid changing room with showers. My sensei is second to none, one of the very few 8th dans in this country with a solid and well deserved reputation. I don’t go on foot to my dojo. I go by tube without major worries in this still safe city. Last summer was incredibly hot in Spain. Our dojo is in a basement and, of course, we don’t have air conditioning, but whenever I needed a sip from the tap, I took it without having to worry about contracting cholera. However, when I reflect on what my period in Haiti has meant in my way I, oddly, find myself missing the Karate training there. I miss working out with people that have lost so much but have not allowed it to alter their will to move on. Never had I seen before more clear manifestations of mushin in a karate dojo as I saw there. I think I also miss the permanent state of zanshin I had to keep not just in but outside the dojo too, and I confess that precept 16th of Shoto Niju Kun (“When you leave home, think that you have numerous opponents waiting for you. It is your behaviour that invites trouble from them”) had not been a particular priority in my daily habits for quite a while. In Port au Prince, given the circumstances, that precept was not an option but a must and I think I kind of miss that too. In any case, training among adversity has proved a valuable lesson and I am very grateful to the instructors and karateka of Haiti’s JKA for allowing me to practice with them. As much as I would have liked it, I didn’t have the privilege to see changes while I was there but I am told that finally, after an unnecessary prolonged and inhuman political impasse, the new Haitian government has started to put into good use the considerable donations received from so many different sources. I am also aware that my karate friends have moved to a new and more suitable dojo, which is fantastic news. All my best to them and may Haiti recover soon, OSS!